I could not be more delighted about this! 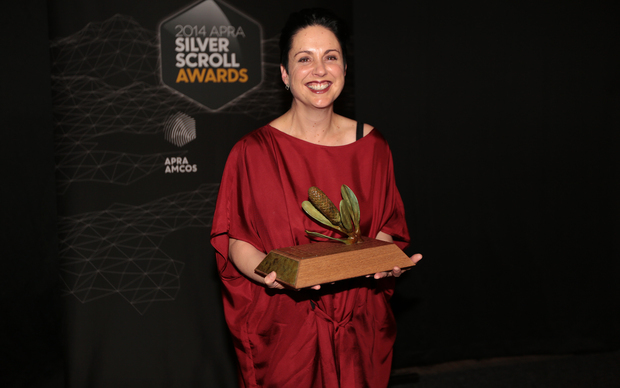 For the first time, APRA – who have presented the legendary Silver Scroll in New Zealand for 49 years, along with the more recent Maioha Award for music in Te Reo and the SOUNZ Contemporary Award for contemporary classical music – offered two awards for screen composers, Best Original Music in a Feature Film and Best Original Music in a Series. It was my great pleasure to be in the company of Dave Long and Peter Van der Fluit as a nominee for the inaugural feature film award. Dave was nominated for his fantastic score for Beyond The Edge (view the trailer here) about Sir Edmund Hillary and Tensing Norgay’s ascent of Everest. Peter was nominated for the extraordinary Romeo and Juliet – A Love Song – a trash-opera retelling of the Shakespeare classic, set in a caravan park! And I was nominated for Field Punishment No.1. Tom McLeod won the award for Best Music in a Series, for his great work on Girl vs. Boy – and he was nominated alongside the super Karl Steven (for Harry) and Andrew McDowell for Wiki the Kiwi. I’ve spoken many times before of our intimate industry and the various inspirations and challenges that go along with writing music for screen in a country with a small population and generally modest resources. I don’t envy whoever judged our awards last night because they were certainly asked to compare apples, oranges and (this being New Zealand after all) an untold array of other much richer and stranger fruit. I felt I was winning by simply being mentioned in the same sentence as Dave and Peter. Apart from anything else, it is wonderful for a music awards ceremony to recognise the work of screen composers because our work is so often, by its nature, invisible – it’s designed to be part of a greater whole. So the idea that it might also considered as a free-standing entity, and listened to for all the details we know are there, but which fall, as they must, into a different context when they are mixed with all the other artful sounds of a film, is quite a lovely one. The awards last night were bloody brilliant and reminded me of exactly what manner of wonder can come from an environment like ours. Luke Buda – himself an award winning screen composer (for Taika Cohen’s film, Boy) and member of the terrific Phoenix Foundation – was the Musical Director of a show that highlighted the mad, glorious, trail-blazing imaginations that exist – in disproportionately large numbers – within our little cultural enclave. There were epic analog synth performances, a white-clad choir whooping and wailing, throat singing, a gamelan orchestra, a giant banjo made out of a kick drum, fields of distorted sound… And everything was beautiful. And everything was about as far away from the shiny, corporatised Top 40 / X-Factor aesthetic as it’s possible to get. Long live originality and rebelliousness. Long live the people who inhabit the edges and the corners and the rocky outcrops and the dangerous places. And please, please can we keep building a culture that treasures and values original thought and fights for the risk-taking and the experiments that drive culture and creativity forwards. I could not have been more proud to be part of our music industry. The score for Field Punishment No.1 was brought into being with much love by many people – not least the writers and producers of the film, Donna Malane and Paula Boock at Lippy Pictures, the ever gentlemanly Pete Burger who directed it, Fraser Brown and his dignified and powerful portrayal of Archie Baxter – and on the musical side, my dear husband Ashley Brown who performed the cello, Nigel Gavin who performed the Ukelele, Justine Cormack, Dianna Cochrane, Amalia Hall, Jess Hindin, Catherine Bowie, Sue Wedde and David Garner who performed strings, Ryan Youens who got all the notes onto paper with tireless diligence, Andre Upston who engineered and mixed the score with Nick Buckton at Native Audio and Radio New Zealand, with his customary ear for detail and musical sensibility, and Tom Miskin, at Images and Sound, who incorporated the score so beautifully into the final mix. HEARIEST CONGRATULATIONS_ we think you are amazing. Well done.